Plantronics Y training cord with mute switch (part #27019-03) for use with Plantronics H-Series Headsets; allows two headsets to function off one amplifier (M22). Also known as the supervisor's adapter cord. Comes with in-line mute switch. 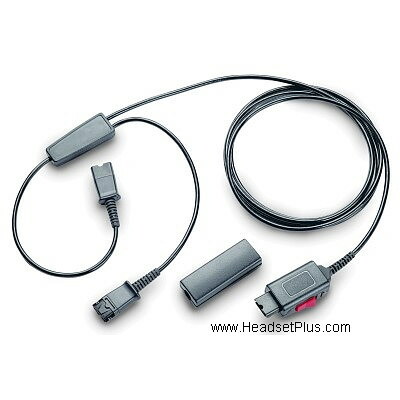 Quick Disconnect attaches to two Plantronics Headsets (H-series, P-Series or Plantronics Cisco Headsets). 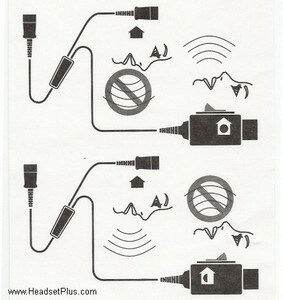 Both headsets can listen, but only one headset have a live microphone. The other microphone is muted. It can also be used with Plantronics Polaris Headsets as well as any Plantronics Headset with a QD (Quick Disconnect) end. Note: The red toggle switch allows the supervisor to control which microphone is live and which is muted. So only one microphone is live at any given time. This product was added to our catalog on Tuesday 11 May, 2004. Plantronics 2.5mm Quick Disconnect cable 18"